I love finding unique ways to craft with recyclable materials. 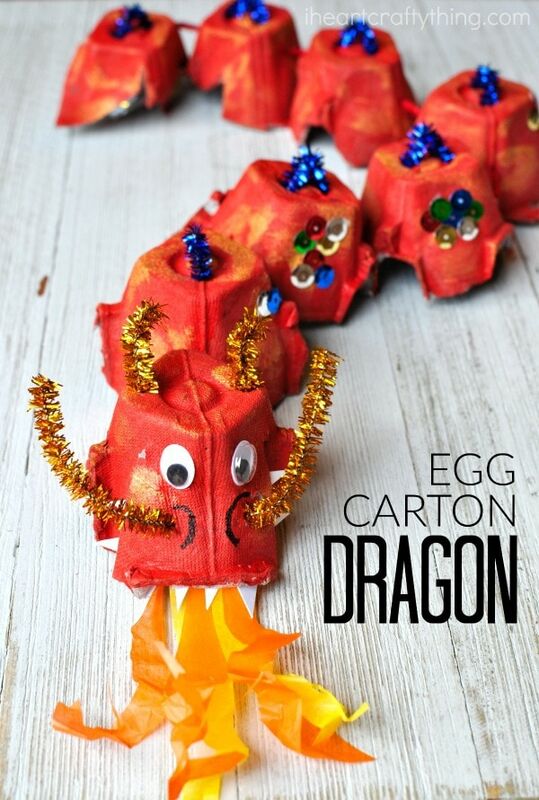 This week with the Chinese New Year on our mind, we created this fun egg carton dragon craft. Some of the steps are bit advanced for young children so they may require some assistance but the end result is stunning! 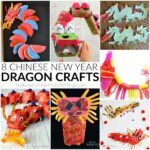 Whether you have been on the hunt for a fun way to celebrate Chinese New Year or simply adore dragons, you are going to love this awesome craft! 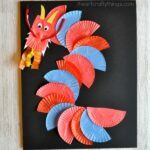 Look for some Chinese New Year book recommendations at the bottom of this post. *We received our Glitter Sticks from our friends at Craftprojectideas.com. All opinions expressed are my own. You can find them at your local Walmart on the craft aisle. 1. Begin by cutting apart your egg carton into individual sections. We used eight sections for our dragon but I thought it was a little long. Make your dragon whatever length you want. Paint the egg carton pieces with your red paint (or the paint color of your choice). Once they are dry, add some gold metallic paint onto your egg carton pieces. Let them paint dry completely. 2. Thread a piece of yarn onto your yarn needle. 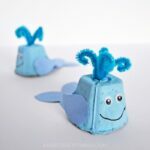 Sew each of the egg carton pieces together. When you get to the last egg carton piece, tie a knot in the yarn, cut off the excess and tape the end down inside the egg carton. 3. Cut a few Glitter Sticks into 4 sections. Bend the sections in half to make a point. 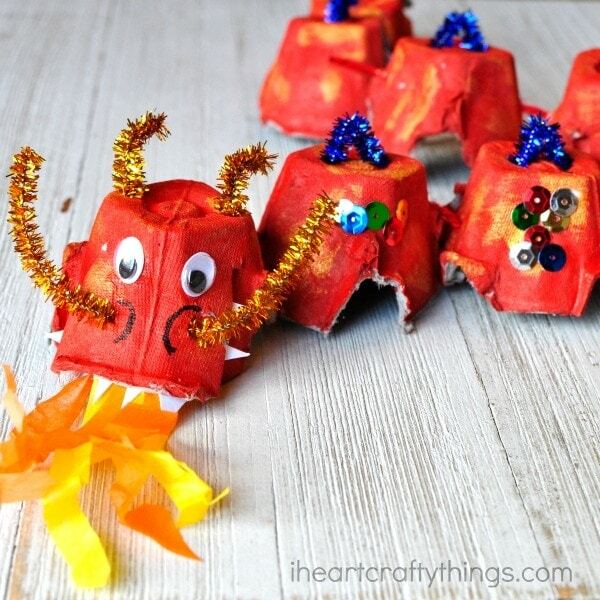 Use your yarn needle to poke two holes in the top of your egg carton pieces and then poke the Glitter Stick pieces into the holes to make dragon scales. 4. Cut out a few gold Glitter Stick pieces and poke them into the top of the dragon face for horns and into the sides of the face for whiskers. 5. To add even more colorful scales, glue colorful sequins onto the sides of the egg carton pieces. 6. Cut two slits in the front of your dragon face to define the dragon mouth. 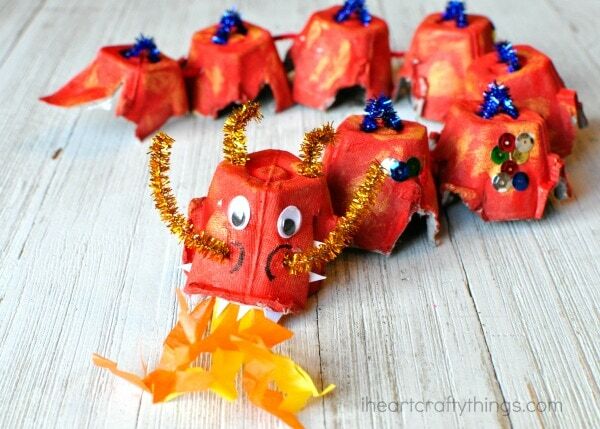 Cut out and glue some white pointy teeth under the mouth along with some small pieces of crumpled up orange and yellow tissue paper to look like your dragon is breathing out fire. 7. 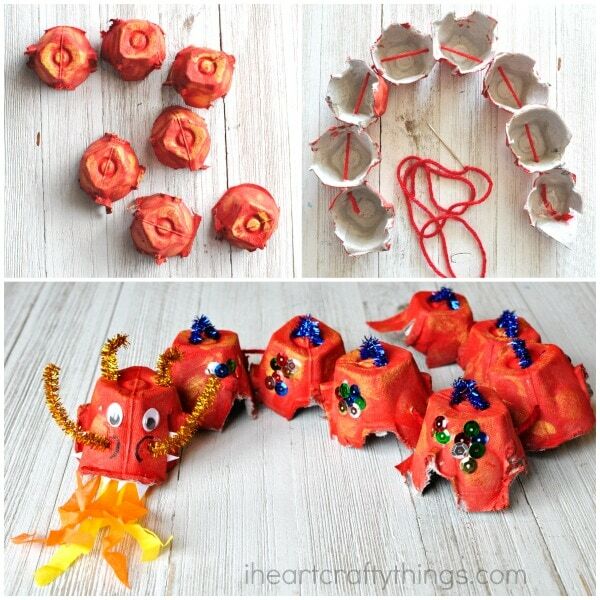 Finish your egg carton dragon craft by gluing on googly eyes and using a black marker to draw on nostrils.